Corvette Racing and their season long tormentors ACEMCO are both mentioned fondly here - a fine GT1 season long battle meant that the factory team could never relax. Not for results but rather for their persistence throughout the season, with a car that proved to be off the pace and ineligible for points, they were there throughout and that’s enough to gain a vote for Maserati Corse from one of our panel. IMSA’s race day crew are an unusual but very worthy nomination here too: there is no better team of behind the scenes professionals in sportscar racing. The top three here though are all racers through and through. Third slot goes to Dyson Racing for the gallant pursuit of the Audis throughout the season and the pair of race wins along the way. Second place, but only just, goes to a popular winner in the GT2 category – Petersen White Lightning has long been in the shadow of the Alex Job Racing freight train, but 2005 saw that change. Pace, great strategy and openness are a great combination – a season long driver pairing of Jorg Bergmeister and Patrick Long is tough on the seat runner mechanism but proved to be a winning formula in a season of world class GT racing. The winning team here though saw off a spirited attack from a top class outfit. The team’s two car effort was spotlessly prepared and raced, driven by a stellar driving squad and provided yet more race wins for the evergreen Audi R8, despite ever increasing obstacles placed in its path. A win at Le Mans was a great big juicy cherry on top of its season. 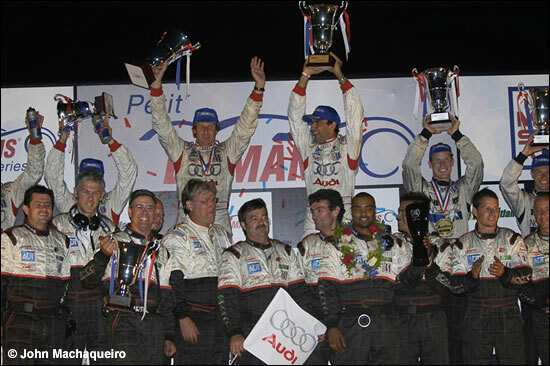 The dailysportscar.com Team of the Year 2005 for North America is ADT Champion Audi. 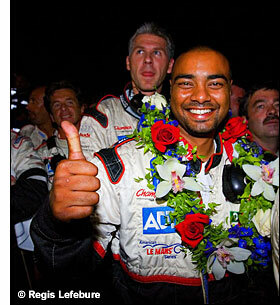 “Won Sebring, Le Mans, Petit Le Mans and the ALMS – enough said!” – Russell Wittenberg.